Brad dropped by a show George South was running on a late November evening in Mooresville, NC. He was visiting friends and also brought his Dad’s maroon-and-gold wrestling boots and maroon ring jacket for me to photograph for the Minnesota Wrecking Crew website. Brad is constantly uncovering buried treasure when sifting through his Dad’s belongings. This time he had found an old metal key ring made by the Zippo Manufacturing Company, the maker of classic lighters going back to the 1930s. 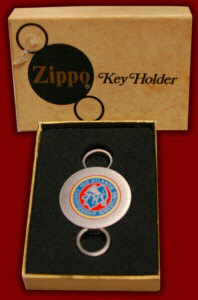 The key ring was embossed with the full color Mid-Atlantic Wrestling logo. Equally cool was the felt-lined Zippo box that contained the key ring, a throw back to an earlier time, with the Zippo logo from over 30 years ago. Brad said he didn’t know the story on this item as it related to wrestling, only that it belonged to his father. We laughed as we speculated that there were probably at one time stacks of these things sitting around Jim Crockett’s office. Perhaps it was a gift that Big Jim gave the office employees, maybe even all the wrestlers. Whatever the case, this was one cool artifact, and a vestige of a simpler time and better days. Since that night, I have reflected back a time or two on that moment and can’t decide what about Brad’s gift meant more to me; that it was something that once belonged to his Dad, the great Gene Anderson, or that the great Gene Anderson’s son had been nice enough to give it to me. Either way, it was more precious than any present I would find under the Christmas tree later that December. Santa Claus had snuck by a few weeks early and brought me the most special gift of all.